You never know who you’re going to wind up sitting behind on a flight. It could be a stressed businessman, a new mom with a screaming child, or ideally, the cutest doggy ever to exist. 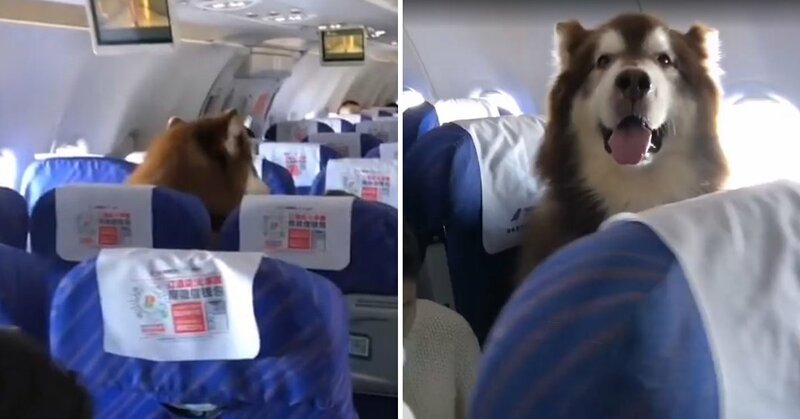 That’s what happened on this recent China Southern flight, where a huge Alaskan Malamute was sitting upright in his seat, just like a real person. Video footage of a beautiful Alaskan Malamute sitting very still – on his very best behavior – has quite rightly gone viral. The gorgeous dog had been seated aboard a China Southern Airlines flight in order to take care of his disabled owner. This Malamute is a service dog, who has reportedly been approved by medical professionals to fly alongside his owner as as a qualified emotional support animal. You can see why – what a calming presence he is! His owner is said to be an emotionally vulnerable flyer, and their huge, furry best friend was permitted to be there in advance, in order to offer comfort and support. I don’t know about you, but I fell in love as soon as he looked at the camera. One person commented that it would be the only time they wouldn’t mind sitting next to somebody on a plane, and I have to agree. Another described him as being a ‘perfect passenger’. “China Southern Airlines strictly follows the Civil Aviation Administration’s ‘Administrative Measures for Air Trafficking of Persons with Disabilities’ to formulate regulations for the transportation of disabled dogs in the company. China Southern only accepts disabled dogs who meet the transportation conditions and have the conditions for flight. Cabin, including: guide dogs, guide dogs, auxiliary dogs, do not accept pet dogs into the cabin. In other words, this malamute is a very, very good boy who deserves his seat.